Recently, we visited Fallon Naval Air Station and will be reporting on the evolving training focus for the US Navy which is closely tied into the other services as well. It is clear that Fallon is a key player in any serious rethink of how to train for and execute high intensity warfare. We will be working through the materials over the next few weeks and shaping a number of pieces, which will highlight various aspects of the evolving approach to training for the high end fight. And this week the US Navy is involved in a pair of naval exercises with regional Pacific and North Atlantic partners practicing for high tempo operatons. The pair of exercises aims to share knowledge and improve interoperability between the U.S. and allies, at a time when China and Russia have each conducted aggressive air actions and have participated in their own joint exercises. Anti-submarine warfare exercise GUAMEX 2017 starts today off the coast of Guam, combining submarines and maritime patrol and reconnaissance aircraft from the U.S. Navy, Japan Maritime Self-Defense Force and the Royal New Zealand Air Force. Exercise organizers say GUAMEX, with about 40 operational scenarios, is designed to strengthen the regional partnership. GUAMEX runs until August 12. Meanwhile, starting tomorrow U.S. forces assigned to the George H.W. Bush Carrier Strike Group will be joined in the North Atlantic by forces from the United Kingdom’s carrier strike group and other allies as part of the Saxon Warrior 2017. Approximately 6,000 U.S. sailors will participate in Saxon Warrior, in which allied forces will participate in training scenarios involving strategic strike, air defense operations, combat air support, and enforcing no-fly zones. The exercise was last held in 2011. Along with the U.S. and U.K., other nations expected to participate include Germany, Norway, and Sweden. “Saxon Warrior allows both U.S. and U.K. naval forces a chance to hone our interoperability skills. Particularly important is the alignment of U.S. carrier strike groups and the U.K. carrier strike group,” Navy Rear Adm. Kenneth Whitesell, Carrier Strike Group 2 commander, said in a Navy news release. And also in play is the Nimitz strike group beginning its operations against ISIS. We would note that the new Nimitz strike commander joining the fleet this Fall was our host at Fallon, Admiral Gregory Harris. The Nimitz Carrier Strike Group (CSG) is carrying out strike sorties from the Arabian Gulf in support of Operation Inherent Resolve (OIR). 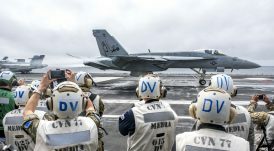 The first aircraft launched from USS Nimitz (CVN 68) was an F/A-18E Super Hornet assigned to the “Argonauts” of Strike Fighter Squadron (VFA) 147. Accompanying Carrier Air Wing (CVW) 11 squadrons, part of that first flight include the “Black Knights” of VFA-154, the “Blue Diamonds” of VFA-146, the “Death Rattlers” of Marine Fighter Attack Squadron (VMFA) 323, and the “Bluetails” of Carrier Airborne Early Warning Squadron (VAW) 121. Byrne credited the entire crew for the first successful flight operations, and he let them know how important they all are to the operation’s success. Carrier strike groups demonstrate the mobility, flexibility and power projection capabilities of the U.S. Navy’s globally deployed force. They also deter potential adversaries, respond to humanitarian crises, reassure partners and enhance security. The Nimitz Strike Group’s deployment to the U.S. 5th Fleet area of operations supports Operation Inherent Resolve and signals the continued commitment to defeat and destroy ISIS. In addition to anti-ISIS missions, the ship and strike group are conducting maritime security operations to reassure allies and partners, preserve freedom of navigation, and maintain the free flow of commerce. As mentioned we recently visited Fallon and will focus on the shift represented by the name change to the Naval Aviation Warfighting Development Center and all that the shift implies with how the Navy is training for the high end fight as it continues its lower end operations as well. Naval Aviation Warfighting Development Center (NAWDC) at Naval Air Station Fallon is the center of excellence for naval aviation training and tactics development. NAWDC provides service to aircrews, squadrons and air wings throughout the United States Navy through flight training, academic instructional classes, and direct operational and intelligence support. The command consists of more than 120 officers, 140 enlisted and 50 contract personnel. NAWDC flies and maintains F/A-18C/D Hornets, F/A-18E/F Super Hornets, E/A-18G Growlers, F-16 Fighting Falcons and MH-60S Seahawk helicopters. 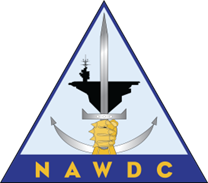 Prior to June 2015, NAWDC was known as Naval Strike and Air Warfare Center (NSAWC) which was the consolidation of three commands into a single command structure on July 11, 1996. NSAWC was comprised of the Naval Strike Warfare Center (STRIKE “U”) based at NAS Fallon since 1984, and two schools from NAS Miramar, the Navy Fighter Weapons School (TOPGUN) and the Carrier Airborne Early Warning Weapons School (TOPDOME). N4: NAWDC’s Maintenance Department is the heart of training for all the NAWDC schoolhouses. Maintenance’s focus is providing mission-ready fleet and adversary aircraft configured with required weapons and systems for all training evolutions. We support day to day training missions with the F-16 Viper, F-18 Hornet and Super Hornet, EA-18G Growler, E-2C Hawkeye and the MH-60S Seahawk; conducting scheduled and un-scheduled maintenance on 39 individual aircraft. These aircraft and weapon systems are the foundation for all other NAWDC Department’s training syllabi. N5: Responsible for training Naval aviation in advanced Tactics, Techniques and Procedures (TTP) across assigned combat mission areas at the individual, unit, integrated and joint levels, ensuring alignment of the training continuum; to set and enforce combat proficiency standards; to develop, validate, standarize, publish and revise TTPs. Also provides subject matter expertise support to strike group commanders, numbered fleet commanders, Navy component commanders and combatant commanders; to lead training and warfighting effectiveness assessments and identify and mitigate gaps across all platforms and staffs for assigned mission areas as the supported WDC; and collaborates with other WDCs to ensure cross-platform intergration and alignment. NAWDC’s Joint NAWDC’s Joint Close-Air Support (JCAS) Division continues to answer the needs of current theater operations with increased production of Joint Terminal Attack Controllers Course (JTACC).NAWDC’s Joint NAWDC’s Joint Close-Air Support (JCAS) Division continues to answer the needs of current theater operations with increased production of Joint Terminal Attack Controllers Course (JTACC). NAWDC JCAS primarily trains Naval Special Warfare and Riverine Group personnel, but has this year also trained U.S. Army Special Operations, U.S. Marine Corps Air and Naval Gunfire Liaison Officers, international personnel, as well as U.S. Navy Fixed and Rotary Wing Forward-Air Controller (Airborne) personnel. NAWDC’s JCAS branch is the U.S. Navy’s designated representative to the Coalition JCAS Executive Steering Committee, and is a recognized authority on kinetic air support to information warfare (IW), tactical precision targeting, and digitally aided CAS. N6: Carrier Airborne Early Warning Weapons School (CAEWWS), also referred to as TOP DOME, is the E-2 weapon school and responsible for Airborne Tactical Command and Control advanced individual training via the Hawkeye Weapons and Tactics Instructors (HEWTIs) class. CAEWWS is also responsible for development of community Tactics, Technique and Procedures and provides inputs to the acquisition process in the form of requirements and priorities for research and development (R&D), procurement, and training systems. CAEWWS works closely to support other Warfare Development Centers and Weapons Schools; such as the Surface and Mine Warfighting Development Center’s Integrated Air Defense Course (IADC) and Integrated Air and Missile Defense WTI Integration Course (IWIC). Other functions include support to advanced integrated fleet training by way of WTI augmentation to the N5/STRIKE Department for CVW integrated training detachments; also known as Air Wing Fallon Detachment and support of squadron activities. N8: Navy’s Rotary Wing Weapons School is composed of a staff of 25 pilots and aircrewmen who instruct the Seahawk Weapons and Tactics Instructor program; provide tactics instructors to fleet squadrons; maintain and develop the Navy’s helicopter tactics doctrine via the SEAWOLF Manual; instruct the Navy’s Mountain Flying School; provide high-altitude, mountainous flight experience for sea-going squadrons; and provide academic, ground, flight, and opposing-forces instruction for visiting aircrew during Air Wing Fallon detachments. N10: The US Navy’s Airborne Electronic Attack Weapons School, call sign “HAVOC”, stood up in 2011 to execute the NAWDC mission as it pertains to Electronic Warfare and the EA-18G Growler. HAVOC is comprised of highly qualified Growler Tactics Instructors, or GTIs, that form the “tactical engine” of the EA-18G community, developing the tactics that get the most out of EA-18G sensors and weapons. HAVOC’s mission is also to train Growler Aircrew and Intelligence Officers on those tactics during the Growler Tactics Instructor Course. The Growler Tactics Instructor Course is a rigorous 12 week syllabus of academic, simulator, and live fly events that earn graduates the Growler Tactics Instructor designation – the highest level of EA-18G tactical qualification that is recognized across Naval Aviation. The Growler brings the most advanced tactical Electronic Warfare capabilities to operational commanders creating a tactical advantage for friendly air, land, and maritime forces by delaying, degrading, denying, or deceiving enemy kill chains.